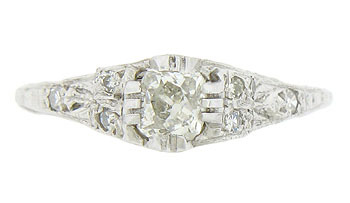 This exquisite antique engagement ring is set with a luminous .32 carat, mine cut diamond. Trios of bold geometric shaped fingers hold the glowing stone as it adorns the crown shaped mounting. Pairs of fine faceted diamonds rise up on either side of the center stone, while single diamonds press into the rings shoulders. 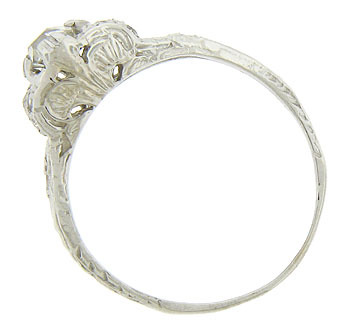 Extraordinary detailed floral engraving decorate the sides and shoulders of this spectacular Art Deco ring. 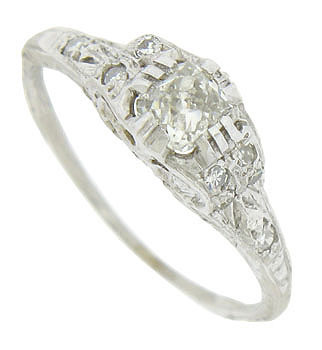 Fashioned of 14K white gold, the ring measures 5.43 mm in width. Circa: 1930. Size 5. We can re-size.